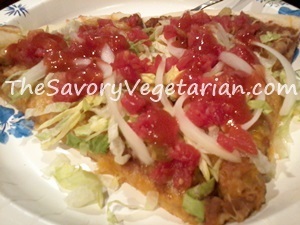 This mexican pizza recipe is our version of the taco pizza we used to order in from Mazzios. It's so quick and easy to make you'll be surprised how tasty it really is. We used Taco Bell taco sauce, canned re-fried beans and canned ro-tel to keep it super simple and budget friendly but by all means, substitute away. It only takes a few minutes to wash and chop a tomato, throw some sliced olives on top or maybe some fresh green onions. Preheat the oven to 400 degrees and grease a large, round pan and roll out your refrigerated crust. Press the dough into the pan and shape it into a fairly even circle, until the crust reaches your desired size and thickness. Spoon the entire can of re-fried beans into the middle of the dough and spread them evenly over the top, leaving about 1/2 inch edge that will form the crust. 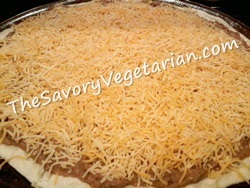 Top the refried beans evenly with 2 cups shredded taco cheese and bake for about 14-16 minutes, until the crust is golden brown around the edges and the cheese is completely melted. Let it cool for about 5 minutes before cutting it into pieces sizable enough to hold your mexican inspired toppings. Top each piece as you eat it, layering on a little bit of shredded lettuce, some ro-tel tomatoes, fresh yellow onion and bit of taco sauce to top it off. Simple, delicious and done in less than 30 minutes. Enjoy! Keep your cold toppings separate and add them right before you eat to keep the fresh produce from wilting. This also keeps your crust getting soggy when you store any leftovers for later re-heating. Re-heat this recipe in the oven on 400 degrees for about 15 minutes to keep your crust crisp and crunchy. Crumble up some tortilla chips and sprinkle them on top of each piece for added crunch. Add sliced or chopped jalapenos for to make your pizza a bit more spicy. 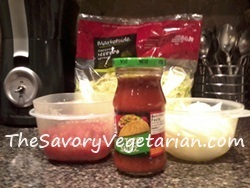 You can also substitute jalapeno cheese or queso in place of the taco shreds for a similar effect.